Lindsey Graham gets called out for his hypocrisy when it comes to judicial ethics and what is – and is not – acceptable behavior by a judge. Editor’s Note: Samuel Wynn Warde is the editor-in-chief of Liberals Unite as well as a contributor. The opinions expressed in this commentary are his own. You can view a list of his articles here. Republican Senator Lindsey Graham of South Carolina was quite the spectacle during last week’s Senate Judiciary Committee hearing with Supreme Court nominee Brett Kavanaugh and his accuser, Dr. Christine Blasey Ford. After hours of emotional testimony from both Christine Blasey Ford and Brett Kavanaugh Thursday, Sen. Lindsey Graham (R-SC) was ready to take a stand — and become Kavanaugh’s most impassioned Republican defender. Former criminal investigator and criminal defense attorney Seth Abramson weighed in on the apparent hypocrisy of Graham’s stance regarding Kavanaugh’s nomination in a Monday morning post. “NOTE: On January 23, 1999, Lindsey Graham told the United States Senate that if a judge commits perjury *even once* he must be immediately impeached. See the video below at 3 minutes, 18 seconds. Either Graham was lying then or he’s lying now,” he tweeted, including a link to a clip on C-Span showing his remarks. The clip, referenced by Abramson in his tweet, is from Day Two of Senators’ questions to prosecutors from the House of Representatives (called House Managers). The question noted below, was question #59 of 105 total questions. Throughout this trial both sides have spoken in “absolutes”; that is, if the President engaged in this conduct, prosecutors claim he must be convicted and removed from office, while the President’s lawyers argue that such conduct does not in any way rise to an impeachable offense. It strikes many of us as a closer call. So let me ask you this: Even if the President engaged in the alleged conduct, can reasonable people disagree with the conclusion that, as a matter of law, he must be convicted and removed from office – yes or no? Continuing, Graham referenced a federal judge who had been removed from the bench for committing perjury. The Constitution reads that upon conviction, the person shall be removed. You have to put it in the context of the judge cases, because that is where it gets to be hard for this body. Because of the precedents of the body when you apply the same legal standard of high crimes and misdemeanors to the fact that a judge who was convicted of perjury was removed by the body, and you conclude in your mind that the President committed perjury, you have a dynamic you have to work through. I think it is important for this body to not have a disposition plan that doesn’t take in consideration the good of this Nation. I have argued to you that when you found that a judge was a perjurer, you couldn’t in good conscience send him back in the courtroom because everybody that came in that courtroom thereafter would have a real serious doubt. Possibly more damning, is Graham’s statement on Constitutional law, given exactly a week before on January 16, 1999. Remember how you felt when you knew you had a perjurer as a judge? When you knew you had somebody who had fundamentally ran over the law that he was forced to uphold, or or responsible for upholding? Remember how you felt when you knew that judge had gotten so out of bounds that you couldn’t put him back in court even though it was unrelated to his court because you’d be doing a disservice to the citizens that would come before him? A judge has a duty to take care of the individuals fairly that come before their court. The president, ladies and gentlemen of the Senate, has a duty to see that the law applies to everyone fairly. A higher duty. A higher duty in the Constitution. You couldn’t live with yourself knowing that you were going to leave a perjuring judge on the bench. Ladies and gentlemen, as hard as it may be for the same reasons, cleanse this office. The vice president will be waiting outside the doors of this chamber. Our constitutional system is simple and it’s genius all at the same time. If that vice president is asked to come in to assume the mantle of chief executive officer of the land, chief law enforcement officer of the land, it will be tough, it will be painful, but we will survive and we will [be] better for it. 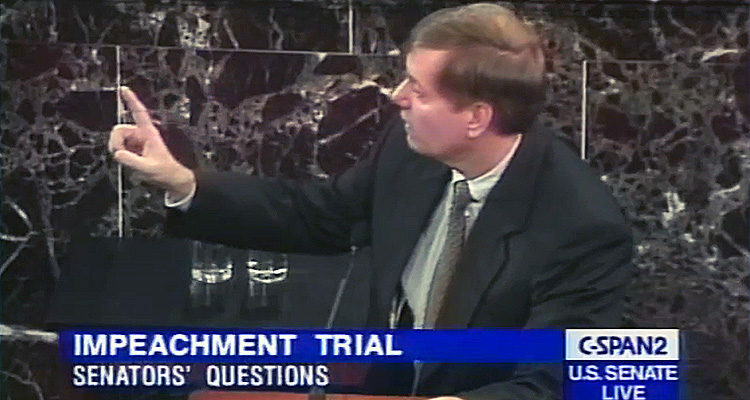 It would appear that Rep. Lindsey Graham from 1999 needs to have a little sit down with Senator Lindsey Graham of 2018.